According to a new market report, the future of the global flat glass industry looks good with opportunities in the building construction glass, automotive glass, and specialty glass. The global flat glass industry is forecast to grow at a CAGR of 5.5% from 2016 to 2021. The major drivers of growth for this market are growth in the construction market, rising automotive production and sales, rising per capita income, and technological advancement. In this market, building construction glass, automotive glass, and specialty glass are some of the major segments of flat glass. On the basis of its comprehensive research, the report forecasts that the automotive glass and specialty glass segments are expected to show above average growth during the forecast period. Within the global flat glass industry, the automotive glass segment is expected to remain as the largest market. Low interest rates and favorable taxation schemes are expected to drive vehicle sales, which would spur growth for this segment over the forecast period. Asia Pacific is expected to remain the largest market due to increase in urbanization, growth in real estate sector and increasing investment by flat glass manufacturers within the Asia Pacific region. Asia Pacific and Rest of the World are expected to witness significant growth over the forecast period because of increasing per capita income and strong housing demand. Q.1. 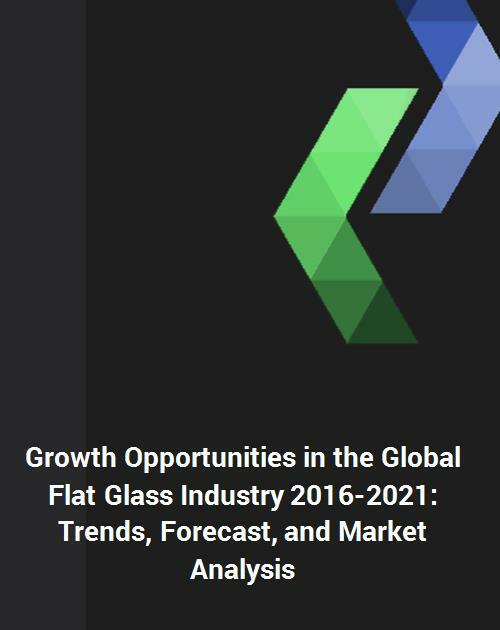 What are some of the most promising, high-growth opportunities in the global flat glass industry by segment and regions? Q.4. What are the key factors affecting market dynamics? What are the drivers challenges and business risks in this market? Q.7. What are some of the changing demands and needs of customers in the market? Q.8. What are some of the new developments in the market? Which companies are leading these developments? Q.10. What are some of the competitive services and processes in this area and how big of a threat do they pose for loss of market share via materials / service substitution? Q.11. What M & A activity has transpired in last 1 to 2 years, and describes its impact on the industry? - Market size estimates: Global flat glass industry size estimation in value ($B). - Trend and forecast analysis: Global flat glass industry trend (2010-2015) and forecast (2016-2021) by region and segment. - Segmentation analysis: Global flat glass industry size by various application types such as building construction glass, automotive glass, specialty glass both in terms of value. - Regional analysis: Global flat glass industry breakdown by key regions such as North America, Europe, Asia Pacific and Rest of World. - Strategic analysis: This includes M&A, new product development, competitive landscape, and expansion strategies of flat glass suppliers in global flat glass industry. - Emerging applications: Emerging applications of flat glasses in various markets. - Fuyao Group Glass Industries Co. Ltd.